Sequoia Capital, the top-tier venture firm, has just closed on a $180 million new fund called Sequoia Scout III that’s focused exclusively on seed-stage opportunities. It’s a development startup founders will be watching closely, no doubt, so we caught up yesterday with Bryan Schreier, a Sequoia partner who sits on the boards of Dropbox, Thumbtack and Qualtrics, among others, to ask how the vehicle works. Sequoia doesn’t talk often about its processes. Perhaps owing to greater transparency throughout the industry, as well as growing competition, including from AngelList — which is increasingly providing founders with seed money to invest in other founders — the firm offered to shine some light on its offerings and approach. More from our conversation with Schreier follows, edited lightly for clarity. TC: This new fund is an interesting hybrid. Unlike in past years, where Sequoia made seed bets from its main, early-stage funds, it’ll be used to invest directly in seed deals. Sequoia also will be incorporating investments that are being brought to the firm by so-called “scouts.” Is that correct? BS: Yes, we have a long-standing seed practice at Sequoia, going back to the very beginning, and this new fund just represents the consolidation of our seed program into a single fund. As with Airbnb, Dropbox and Stripe, we’ll be looking for seed investments that we’ll be investing in directly. We’ll also be [relying on Sequoia’s network of more than 100] scouts, who come from the Sequoia network [and who are mostly] founders and execs. TC: Great. Before we get into the mechanics, who are the investors in this new fund? BS: It’s a similar base [as our other funds]. A vast majority are nonprofits, so when companies have large outcomes, those gains go back to supporting nonprofits. TC: There has long been fascination over this scouting trend, which Sequoia sort of helped to create and a lot of venture firms now employ. Can you talk a bit more about it? For example, how transparent are these founders when they approach their network on behalf of Sequoia? Also, do they have to scout on your behalf exclusively? BS: We encourage them to be totally transparent. That’s always been the case. The money that’s wired [to a startup] literally says “Sequoia.” As for whether the scouts work exclusively on behalf of Sequoia, we don’t require it, but I’d guess that for the most part they do. TC: What kind of cut do they receive, and does the entire network of scouts benefit if one scout finds a winner, or does the person who brought you the deal reap the financial rewards? BS: There’s carry in the fund that’s shared among the scouts, [so] they all benefit from the returns in the scout fund [when a company performs well]. BS: We’ve actually found the most success in following the entrepreneurs. There’s a bit of a virtuous cycle, where you have entrepreneurs who have inspiration of their own and as they’re successful, other founders come to them with their ideas. And it’s a wonderful way for us to double down [on that network]. TC: You’re making direct seed investments, as well as working with these scouts. In both cases, does Sequoia receive information rights? Warrants? Right of first refusal? BS: There’s a big difference. Scout investments are led by scouts, and we don’t have information rights. It’s meant to empower founders in our network who may not have the administrative support or overhead required to run a seed-investing practice, so they are making decisions together with us. But it’s different from a Sequoia investment in that Sequoia isn’t on the cap table of the company; we aren’t taking information rights or board seats. TC: How much of this new fund will be invested with the help of scouts? BS: We really won’t know that until the fund is invested. TC: You’ve personally led seed deals, but you don’t manage this program. Is there anyone at Sequoia who is sort of leading the seed-investing charge within the practice? BS: We all do [seed investments]. In fact, we make the same number of seed investments per year as we do A-stage investments, which is one or two per investor. When I’m meeting with an entrepreneur, I highlight that we’re one of the most selective — if not the most selective — firm when it comes to these investments, because we see thousands of companies each year and we only partner with a couple per investor, and about half the time, that’s a seed investment. TC: It sort of begs the age-old signaling risk question. Is there a risk to a startup that receives a seed check from Sequoia but isn’t able to raise follow-on funding from the firm? BS: We’ve pulled data on this and a company that has raised seed funding from Sequoia is three times more likely to raise a venture round — no matter what. I think it shows that company building does matter a great deal at the early stages and that our model is a great fit for startups. TC: Do you spend a lot of time with these startups? I know Sequoia is averse to party rounds. TC: Do you invest in an idea? How much traction do you need to see? BS: I want to make sure founders understand that it’s never too early to meet with Sequoia. I think we’re one of the few qualified firms to scale a company from the idea stage to an IPO. I also think there’s this myth that you get one shot at Sequoia. But exactly the opposite is true. Companies like the [online services marketplace] Thumbtack we knew for three years before we invested. With [payments company] Square, we were close to [founder] Jack [Dorsey] for a year and a half before becoming investors. We tend not to get married on the first date, so it’s wonderful to meet as early in a company’s life cycle as possible. TC: How is seed-stage funding changing, in your view? Less money is reportedly flooding into deals. BS: I think it’s because it’s really hard to get right. It’s a very long time to liquidity. It seems like an interesting hobby to get into, but once you’ve waited 10 years for an exit, it becomes a little less appetizing. TC: I’m guessing you’re aware of Spearhead, a new effort by AngelList that gives scouts capital to start their own venture capital funds. Is that a trend we’ll see play out more frequently? BS: I’m not as familiar with those efforts, but this is our third scout fund, so this is something we’ve been doing for a while. If we weren’t the first, we were one of the first to empower founders with scout programs, so it’s exciting for others to be doing the same. TC: Before we let you go, what’s one of your most recent seed deals and what about it grabbed your attention? 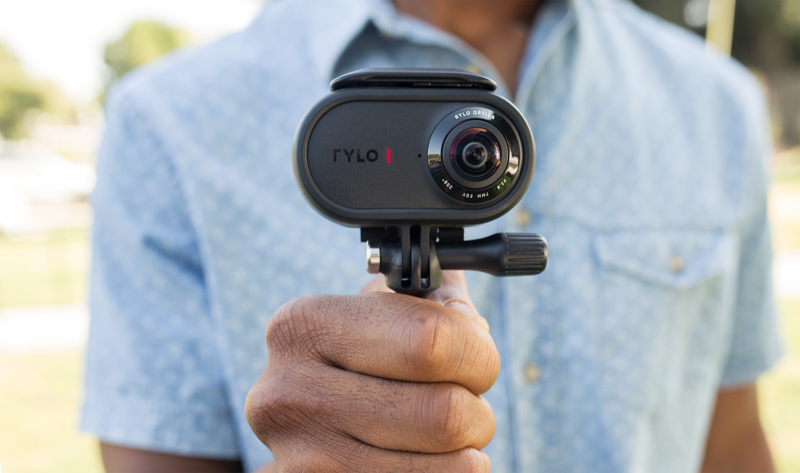 BS: We partnered with Rylo [a next-gen 360-degree camera company whose product is featured above] at the seed stage a little over two years ago. It’s a hardware play. It’s about as high risk as you can get. But we think it’s a magical product that’s going to reinvent the way we film video. TC: But everyone has a smartphone camera. There’s no shortage of action cameras. What were you looking for precisely? BS: Team and product. With this company, we knew that we had the two best people in the world to build such a product, and when you look at Amazon reviews, Rylo is two or three stars ahead of any product on the market. It’s software and app first, instead of hardware first, and that changes everything.